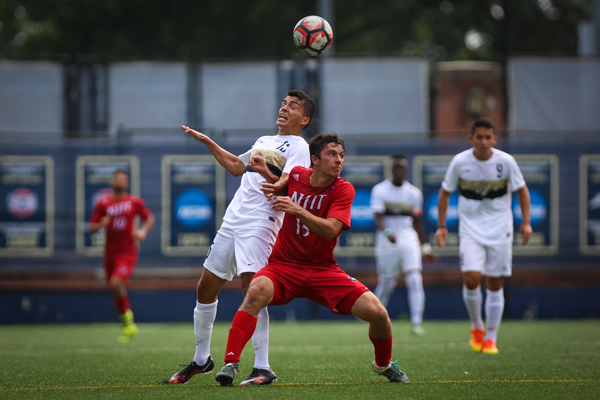 Senior midfielder Angel Valencia flicks on a header during GW's 1-1 draw against NJIT this Saturday. Valencia is one of nine seniors on this year's experienced men's soccer squad. This time last year, not much was expected from the men’s soccer program. Picked to finish 10th in the 2015 Atlantic 10 preseason poll, the Colonials lost five of their first seven games in non-conference play and looked destined to miss the postseason for a fourth year in a row. But just a few months later — thanks to an inspired 6–2 run in league play where GW outscored opponents a combined 11–4 — head coach Craig Jones was tabbed A-10 Coach of the Year for leading his group to an improbable first-place regular season finish. Although a 4–0 upset at the hands of No. 8 seed VCU in the first round of the playoffs cut the Cinderella story short, the journey showed the Colonials what they are capable of. “We learned what it takes to win,” senior co-captain Garrett Heine said. Heine — a forward who led GW with nine goals and posted four assists during his breakout junior season — is one of nine returning seniors on the 23-man squad, which opened its 2016 slate Aug. 26 with a 2-1 victory over William and Mary. With a disappointing conclusion to 2015 behind them, but lessons from last year’s run still in the fronts of their minds, Jones and his veterans will try to go further than they ever have before during the coach’s four-year tenure. But they said they are still taking it one small step at a time. The team is already off to a sturdy 1-0-2 start, and earned a No. 8 ranking in the National Soccer Coaches Association of America (NSCAA) NCAA Division I Midwest Poll after the first week of competition. Aside from Heine, this year’s most impactful offensive weapons include juniors Christian Lawal and Oliver Curry, who combined for six goals and five assists last year. Junior Koby Osei-Wusu, an assist-machine in the midfield, and sophomore Dylan Lightbourn, who scored the game-winning goal at William and Mary, will also be crucial to the team’s success. On Saturday, Curry scored the Colonials’ lone goal in a 1-1 double-overtime draw with the New Jersey Institute of Technology. Senior Tobi Adewole will steer the Colonials’ back four, which most notably features the addition of senior transfer Ben Ogedegbe, who played for the under-23 Nigerian national team this summer. In addition to leading GW to seven shutouts in his 16 total starts as a junior, Adewole was good for one goal and two assists. He and Heine were named to the 2016 Preseason All-Conference team Aug. 24. While the roster features a number of upperclassmen, who Jones said will be the driving force in the team’s success this season, the head coach is happy with how well the incoming class gelled with returners in the team’s season opener. “We can improve still offensively and defensively, but we are probably ahead of where I anticipated us being at this stage of the season,” Jones said. Heine, who said his personal goal is to put up at least 10 goals and 10 assists this year, is also embracing his new leadership role. Sophomore goalkeeper Thor Arne-Hofs will be GW’s first-stringer in net after a strong freshman campaign. Arne-Hofs made seven starts in 2015 behind then-senior Jack Lopez and tallied 4.14 saves per game – fifth-best in the A-10. Arne-Hofs is already making an impact, posting a conference-leading 0.58 goals against average through GW’s first three contests. The German-born goalkeeper said a year of experience under his belt has helped him to captain GW’s defensive game plan. The Colonials look to remain undefeated when they travel to Loyola Maryland on Wednesday.